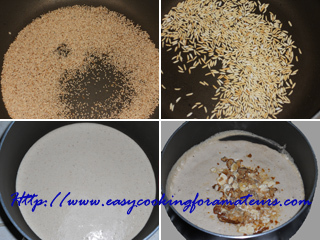 Dry roast poppy seeds & rice separately till they become fragrant & changes its colour. Set aside to cool. Grind poppy seeds, rice & coconut with some water to smooth paste. Pour it to nonstick pan. Add jaggery, bring it to boil. Keep stirring till it becomes thick & the raw smell goes. Note: It should not be too thick or too thin. Add cardamom powder, stir for 5 sec & off the heat. 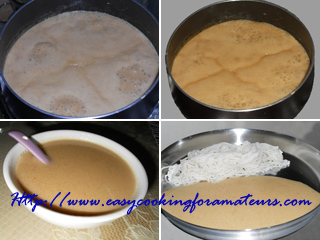 Kai Haalu/Coconut Sweet Milk is ready to serve hot with fresh rice noodles/shavige or holige/oobattu, this can also be served as a drink. Irresistible kheer, coconut,rice and poppyseeds together in kheer sounds truly interesting..
Thats a yummy n sweet coconut milk..Nice combo with rice noodles! Excellent combo. Buttermilk looks yummy. Yummy! Great as Sunday dessert! 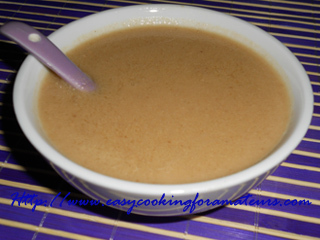 Delicious kheer..adding poppy seeds sounds interesting..
New one .. it sure must taste good. Lovely looking coconut milk. Delicious preparation.